VAN MORRISON Back On Top (Official US RIAA Certified Gold Award issued to commemorate American album sales in excess of 500,000 copies of the Pointblank/Virgin Records album, presented highly respected sales and marketing executive. 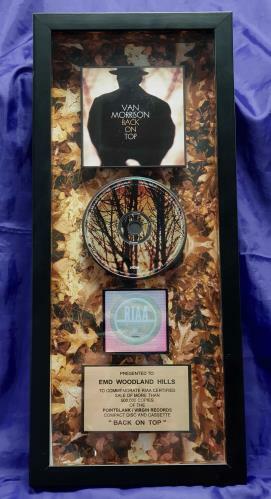 This nicely framed and glazed award measures 21" x 9" in size, and features a floating design with the sleeve artwork at the top with a copy of the Compact Disc, RIAA hologram and the authentic, custom engraved dedication plaque below all mounted on a leaf design mount, in a 2" deep black wooden frame). or visit our Van Morrison image gallery.